If you want a simple DIY fashion project, crocheting a scarf is a great idea. Follow some simple steps and get ready to flaunt your stylish, self-made scarf. Begin by choosing your yarn and its color. There is a plethora of colored yarns available in craft stores with almost infinite choices of texture, thickness, and color. You may opt for a classic, solid colored scarf or be a little bit playful with a striped scarf by changing yarns every few rows. If you want to be a little bit more adventurous and spontaneous, try using a multicolor yarn which creates the pattern for you while you make chains and loops of crochet patterns. Featured colors in a scarf made with multicolor yarns will vary in length, making color change quite unpredictable. A random color pattern created by using multicolored yarn when crocheting a scarf can result in a final piece that matches almost any outfit. When it comes to picking the right hook, simply conduct a test on how your yarn will handle the hook as you try and make a chain. If the yarn splits as you grab it with the hook or it seems quite a challenge to hold onto it through the hook, change to a larger crochet hook size. If you see that the yarn stitches are too loose, switch to a smaller crochet hook. Deciding on the exact dimensions of your scarf and correspondingly calculating the total number of stitches and rows is another prerequisite to crocheting a scarf. Typically, the length of crocheted scarves falls between 55 and 100 inches. Once you have picked out your yarn and hook and decided on the logistics, it is time to begin crocheting. Start by making a foundation chain by creating 15 crochet stitches. For the first row, hold the first single crochet in the second chain using the hook to create a loop. In the end, you can leave the remaining loop to create fringes in your scarf. After finishing the row, you should have 14 single crochets. Next, chain one stitch located at the end of the row you've made. Turn your work to begin crocheting the second row. For the second row, place the single crochet in the two loops of the stitch. Again, you must end up with 14 single crochets. Repeat this until you achieve the desired length of your crocheted scarf. When you've reached the last row, do not hook or chain the first row to the end. To finish off the scarf, trim the yarn at the ends. If a simple scarf isn't right for you, try a loop scarf. To crochet a loop scarf, create the foundation chain. This particular pattern will simply repeat a right side row and left side row on the scarf.When working on the right side rows, insert your hook under both loops and put them together by forming another loop. Release the loop with your hook and, using your left hand, elongate the loop. Create a single crochet located in the back loop. 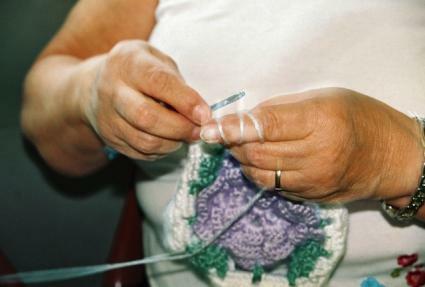 While you are crocheting the left side rows, the procedure will be the same except for the final step. At the last step, create a single crochet using the two loops coming from the two single stitches from the previous row. Alternately repeat the two rows until you achieve the desired scarf length. Finish off your scarf by trimming and weaving in the remaining yarn. To add stylish fringes to the ends of your scarf, begin by first deciding how long you want the fringes to be. For instance, if you want fringes that are three inches long, cut the yarn into six inch lengths and then fold them in half. Attach yarns one by one into the crocheted stitches at the scarf's end. With the folded strands, use your crochet hook to insert them through the single crochet stitch. Knot the threads by inserting both strand ends into the loop that you created. Pull and you instantly have two strand-fringes in the single stitch. Repeat the steps until you create all fringes. The quality of the yarn you chose will determine how comfortable your scarf is and how stylish it looks. Once you have finished your project, you will have a custom designed scarf made just for you. Finish off with a crochet cotton hat and you'll be ready for any winter day.